For first-time mother Mrs Junior Dhliwayo Murehwa, her month-old twins were a double blessing, but like a gift that keeps giving, her boys yesterday charmed President Mnangagwa who gave the family a present of US$400. Mrs Dhliwayo Murehwa, from Triangle, has been at Parirenyatwa Group of Hospitals since she gave birth to Anotida and Anashe on January 6. One of the boys is in a nursery because of low birth weight, forcing the mother to remain holed up in Mbuya Nehanda Maternity Ward at the country’s largest referral hospital. Faced with medical expenses and other related costs, the monthly National Environment Cleaning Day came to Mrs Dhliwayo’s rescue. President Mnangagwa visited the hospital yesterday to take part in the clean-up and after planting two indigenous trees and doing some cleaning at the hospital, he headed for the maternity ward. His first port of call was Mrs Dhliwayo Murehwa’s bed where he congratulated the young mother. After sharing a few jokes with her, President Mnangagwa handed over US$400 to Mrs Dhliwayo who did not expect the princely gesture. The first-time mother said she was stunned by the President’s compassion. “These are my first children and never expected this,” she told The Herald. President Mnangagwa’s benevolence did not end with Mrs Dhliwayo Murehwa as he also handed another US$100 to Mrs Lacey Mbaluku who had a stillbirth. 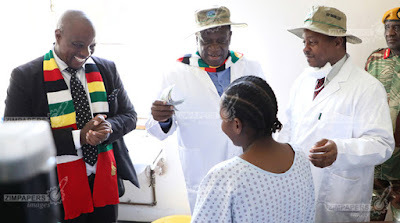 Addressing people and stakeholders who had gathered for the clean-up, President Mnangagwa said the Mbuya Nehanda Maternity Ward needed refurbishment. “We came here and I know you have cleaned everywhere but I entered into Mbuya Nehanda Maternity Ward and discovered that it needs a lot of refurbishment,” he said.